Who’s Watching Webinars These Days? 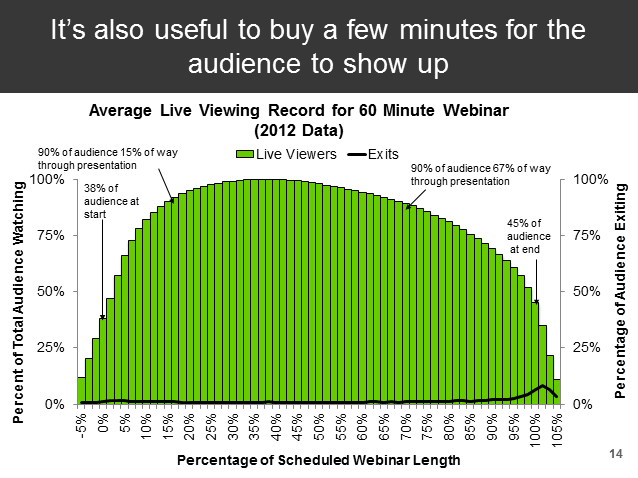 On average, 90% of the audience has shown up 15% of the way into each webinar. So, if you’ve something interesting to say, best save it until you’re about 20% (one fifth) of the way into your webinar! The average webinar duration on BrightTALK is 41.8 minutes, while videos run for just 20.7 minutes on average. 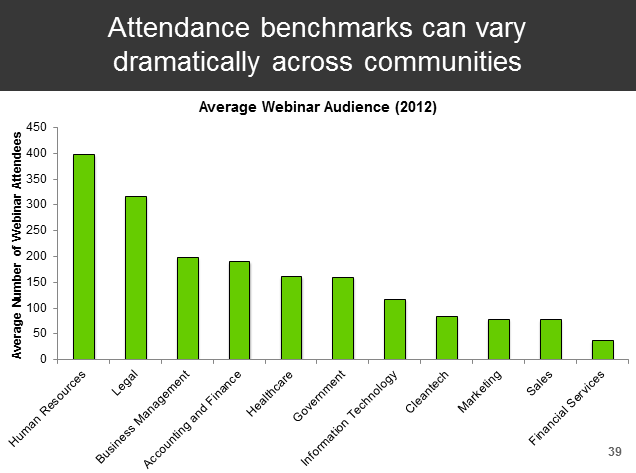 Webinar viewing is still predominantly a desktop or laptop-based experience. Less than 5% of viewings come from tablets or other mobile devices. Around 40% of people watch a webinar or on-demand video from start to finish. The rest arrive late or leave early. Great stats to bear in mind while planning your next webinar. See the full data presentation at https://www.brighttalk.com/webcast/1166/64245. Posted on July 12, 2013, in Content, Digital Marketing and tagged data, research, video, webinar. Bookmark the permalink. 3 Comments. It’s interesting to see the ‘no show’ rate double. I wonder if that is due in part to the fact that many webinar hosts will send out the webinar after it’s completed to registrants and they’re able to watch at their leisure? I’m a stat geek, so this post is right up my alley – Thanks for sharing! Thanks for your comment :) Yes, I suspect there are several factors at play that may explain the rising ‘no show’ rate. People are more aware of the general availability of on-demand video, they’ve learned that there are no penalties for not showing up (if anything, most companies reward you by making the on-demand content easy to find! ), diary scheduling is becoming looser (as work time becomes more flexible, less tightly bound) and there’s an ever-growing body of content available, far more than we can physically consume. I’d hazard a guess that no shows will continue to rise slightly but plateau around the 40-45% mark. What do you think? I completely agree. IF a company/professional should see a no-show rate higher than 45%, I’d think they should take a gander at their webinar content and online reputation, and credibility. If I’m truly excited and am anticipating a webinar, I will plan my schedule around the webinar; just as I would for a meeting.